There I go complaining about not writing enough and what happens? Two posts in as many days! Work, work, work is starting to seep into my conciousness. What I'm doing now is so different than what I did before, I am finding it a bit trying. The scope of what I need to do is large and I don't know if I can actually accomplish what I want. I have to depend on other people to follow through, to take direction from me, and change some of their current habits. I'm asking a lot. I am game to try though. Today, I got a massage. I've been doing this once or twice a month for a few months. It's a nice complement to the physical therapy. I often come out feeling a bit dazed. Today, I should've gone home for a nap but instead I came to a coffee shop, had a sandwich and some coffee. I read for a while and now I'm writing. While I was getting the massage, my thoughts drifted to different guys I've dated and some of my relationships. I thought about the fellow I used to call VIP-ex (no longer! ), later I think he became Tim. Let's go with that. He was my longest relationship and we dated in grad school. Back then, I was the conventional one and he was anti bourgeois morality. Fast forward 20 years (whoosh! ), and who is leading a conventional married life with two small children? Not me. Who is dating semi-frequently and having more casual "fun" type relationships. Not Tim. I agreed with him back then that I was more conventional. I assumed that I would get married and have kids (most likely in that order). It's still a little hard for me to believe that my life never took that shape (though I suppose it's still possible it will). Maybe I shouldn't be surprised. Tim was the type of person who needed a girlfriend. When we first met, he had a girlfriend he was living with. As soon as she left town for good, he started spending a lot of time with me. We drifted into a pseudo romantic situation, that just edged on actual coupledom. We spend every lunch together and part of every weekend. And then we really were physically together too. And he still had that girlfriend in NY. I was NOT his girlfriend. I was miserable. I couldn't stand the thought of leaving him because I liked him so much. I didn't want to give him up. We had a rocky road for a couple of years, I dated other people, so did he. Then, finally, his NY girlfriend dumped him and we got together for real. About a year later, when Tim moved away, I knew we were doomed. He needed an everyday girlfriend. He got one pretty quickly; she is the woman he married. So--he needed to be with someone. He couldn't be happy otherwise. I never did. I like having a boyfriend but it's also hard on me. I get very wrapped up in his needs and often don't stop to do basic stuff for myself. With Tim, we dated long enough to achieve some balance but we never stopped having pretty serious conflicts. What's my point? I know what I think I want and I know what I've done. I was really happy with Kent in Paris and other parts--and I still think that under different circumstances he and I could've had a relationship under non-fantasy circumstances. But, maybe that's a fantasy too? All of the casual dating I've been doing isn't ideal and at times it's been hard on me emotionally. Yet I do get some satisfaction from it. I'm not sure how to do it, but I think I need to readjust my expectations for myself. It doesn't mean that I don't want a steady, real emotional connection with a man, but think my actions should be a lesson to me. Anyway, the guy I had a date with last week, I had another date with this week. We can call him Ben. He's sweet and we get along well. He is young (what is up with that?). Because of the age difference and what it means about our "life stages" I don't think he'll be my bf, but I enjoy spending time with him. We have a little text-contact in between (mostly initiated by me, but whatever!). I think we'll see each other again, after he gets back from his holiday travels. If we don't, well, I have done a much better job of tempering my expectations. I expect him to be a friend and not leave me hanging. That's about it. So far, he's fulfilled this expectation. I can see that he's been letting me take the lead--maybe because I'm older? I don't know if it matters much, but it's something to be aware of. Anyway, it does feel good to have a little something on the books, even if he's not my one true love. I've already had a couple (three?) of those in my life, which is definitely something I appreciate. 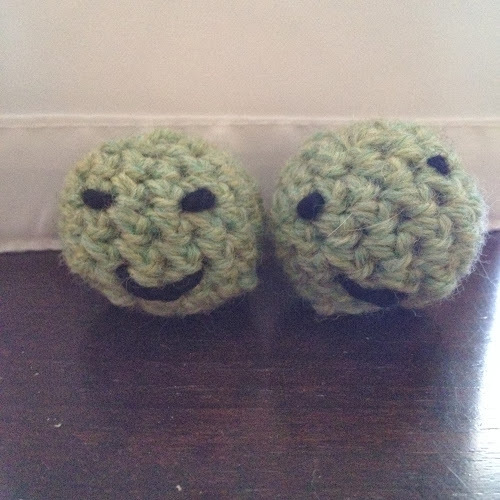 Oh, and here's something cute I made--crochet this time, not knitting. Two peas, no pod.